For those of you who are new to the world of Recognized Competitions or those of you who are seeking some guidance in making your way through the entry requirements for a recognized competition, this article is intended to provide you with basic information required. As also, it is strongly recommended that you familiarize yourself with the USEF Rule Book - and if you are uncertain about specific entry requirements for particular show that you contact that show's secretary. USDF requires a Horse ID number to compete in a recognized show and this number is required on the entry form. If your horse is already a lifetime registered horse with USDF, then you do not need a Horse ID number. Your USDF registration number serves as your USDF Horse ID number. A USDF Horse ID number without a registration will not allow you to compete for USDF awards or regional championships. If you do not have a USDF Horse ID number or registration at the time you enter, you may apply for one with the show secretary before you compete. A Horse ID number costs $35 or a lifetime registration costs $115. If you intend to compete for USDF awards or compete in the regional championships, you should get a lifetime registration. You can also apply your Horse ID registration cost toward a lifetime registration. Horse IDs are valid for life. Visit http://www.usdf.org/join/horse.asp for more information. Also, every owner and rider must have a USDF number recorded and these numbers are required on the entry form. If the owner or rider is not a USDF member, then they must obtain a nonmember identification number (NID) or a GMO or participating membership in order to compete in a Recognized competition. As a USDF non-member you will have to pay the $35 non-member fee with each entry. If you are a member of WNYDA, you automatically receive a USDF GMO membership as part of your membership fee. You must be a participating member to be able to compete and be eligible for USDF awards (horse-rider and horse awards) or regional championships. GMO membership does make you eligible for rider (only) awards. If you do not have a USDF member number for the owner and rider at the time you enter, you may apply for membership with the show secretary before you compete or you can apply for a non-member ID number (NID). There is no fee for an NID. If you intend to compete for USDF horse or horse-rider awards, you need to become a participating member (cost is $90). 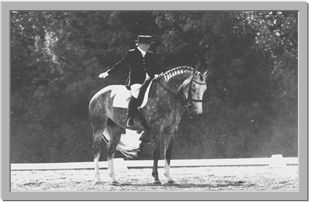 There are some exceptions to this USDF requirement -including persons or horses competing in Opportunity Classes, USDF Introductory Level tests, pas de deux, and quadrille classes; and assistant handlers in dressage sport horse breeding classes, leadline, walk-trot or academy classes only. As for USEF requirements - All horses competing in USEF-recognized competitions (except those activities enumerated in GR901.9 in the USEF Rule Book) must be properly identified and must obtain a Horse ID number from USEF. An identification number for each horse must be entered on entry forms for recognized competitions. If your horse is already lifetime recorded with USEF, then you do not need a Horse ID number. Your horse recorded number serves as your USEF Horse ID number. A USEF Horse ID number without having your horse in "lifetime recorded" status with USEF will not allow you to compete for USEF awards or Regional Championships. USDF and USEF have an arrangement regarding Horse ID numbers. If you obtain a Horse lifetime registration or Horse ID number with USDF, this number will be automatically filed with USEF as your Horse ID number therefore saving you the step of applying for a USEF Horse ID. This USEF Horse ID number is not the same as a horse recording certificate. You will receive a confirmation from USEF once the USDF Horse ID or lifetime registration is accepted by USEF. If you already have your horse lifetime recorded with USEF then that is your Horse ID for the USEF regardless of what your USDF Horse ID number is. Similarly to last year's competition requirements for USEF, every rider/handler, owner, trainer and coach (coach is optional only if you plan to have a coach with you at the competition) must have a USEF membership. If any of the rider, owner, trainer or coach are not USEF members, then you must pay the $45 non-member show pass fee for each individual. If the rider is also the owner and trainer - and the rider is not a USEF member - then you only pay the non-member show pass fee once for that individual. There are some exceptions to having to pay the $45 non-member show pass fee if you enter only Opportunity Classes at a recognized show then this fee is waived. You should plan ahead for your recognized competition season by ensuring that every rider and owner have a USDF participating or GMO membership number or a non-member ID (NID) number. For every rider, owner, trainer and coach (optional only if you use a coach at the competition) ensure that you have a USEF senior (or junior) membership number or you will have to pay the $45 USEF show pass fee for each rider, owner, trainer and coach with your entry (for each different individual - if the rider is also the owner, trainer and coach then only pay one $45 non-member fee). USDF non-members (rider and owner) must pay a $35 non-member fee per entry. For your horse, ensure that you have a USDF Horse ID number or lifetime registration number. As for USEF, if you have your USDF Horse ID or registration, you may use that for your USEF Horse ID as well. If you plan to compete for any horse or horse-rider awards or in the Regional Championships your horse must have a recording certificate from USEF and a lifetime registration from USDF and you must be a USDF participating member and USEF Senior (or junior) member. Entry Process for 2018 Recognized Competitions. 1. Make a plan for your 2018 show season early. If you plan on riding in 2 or more recognized competitions, it is worth your while to join USEF as a Senior (or junior) member to avoid paying the $45 non-member show pass fees for every show. If you are competing someone else's horse, you need to remember that the non-member fees apply to the rider, owner and trainer (and coach if applicable). You need to join as a Senior or Junior member if you plan on competing. As you are making this decision, remember that several recognized shows in our area may actually be 2 one day shows in 1 weekend, in which case you would be required to pay the non-member fees each day of the show. 2. Do you plan on going for awards? If you do, you need to be sure you join the organizations that you are interested in competing for awards in – WNYDA, USDF and USEF all require memberships if you compete for awards, and you must be a member in good standing at the time the scores are earned. You must join as a participating member in USDF (except for rider only awards) and Senior (or Junior) member in USEF to be award eligible. USDF requires your horse be registered to compete for awards. USEF and USDF will require your horse to be properly recorded/registered to be award eligible or to compete for awards or in the Regional Champions. A horse recording/registration with USEF and USDF can be used as your Horse ID numbers, however, simply having a Horse ID number without a recording/registration with these organizations is not enough to compete for awards or to compete in Regional Championships. Your WNYDA membership does include a USDF Group Organization membership, which does make you eligible for rider only awards. If you are competing as an amateur, you must apply for Amateur Certification as part of the USEF membership process – otherwise you cannot ride in Adult Amateur classes or for Adult Amateur awards. You must be a member at the time the scores are earned and you must provide competition management with membership information and adult amateur certificate. For additional details about these organization’s award programs and additional qualifications, contact each respective organization or visit their web sites: www.usdf.org and www.usef.org. 3. Prepare your paperwork. Your Omnibus will come with one entry form. Make copies of the entry form for your use during the show season. When you copy the entry form, be sure to copy it double sided, since you cannot submit your entry form on 2 pieces of paper. There is also an electronic version of the Recognized Competition entry form on WNYDA’s web site. You might want to clearly write in your name, address, horse information and membership numbers before copying to save you some time later – as long as you know these will not be changing during the show year. Please note, you cannot make copies of signatures on the entry form – they must be originals. Also, get out your membership cards (from USDF and USEF) – including yours, the rider’s, your trainer’s, your coach’s, the horse’s owner and the horse’s membership information – and get them copied. These will have to be submitted with every Recognized Competition entry form – so it is easiest if you copy them all on one piece of paper and make multiple copies so you have them to submit with your entry forms. An easy way to get all your membership card information copied for use is to use the web site www.EQverification.org to print out your USEF and USDF membership information on one page. This helps keep paperwork down to a minimum for the show secretary. If the rider, owner, trainer or coach is not a USEF member, you will need to pay the $45 USEF non-member show pass fees (for each non-member). Also make multiple copies of your horse’s 2017/2018 Negative Coggins test and copies of your horse’s Rabies Certificate (valid within one year of the date of the competition). 4. A new rule effective April 1, 2016 (GR845), is a horse more than 7 months of age entering the grounds must be accompanied by documentation of Equine Influenza Virus and Equine Herpes Virus (Rhinopneumonitis) vaccinations within six months prior to entering the stables. Horses not in compliance with this rule may be required to leave the competition grounds. Evidence of these vaccinations can be obtained from your veterinarian and a copy should accompany your entry form when sending to the show secretary. 1. Prepare your information early. There is an opening and closing date on each prize list. You can submit your entry up to the closing date (note that some shows require receipt of your entry by the closing date to avoid post entry fees), however, it is advisable that you submit your entry early. This will help to ensure your acceptance at the show (just because you send your entry before the closing date doesn’t necessarily mean there will be “room” at the show to accept your entry – as they work on a first come, first served basis). Getting your entry in early also allows you to take time to correct your entry before the closing date if there is an error. 2. Prepare your entry package. Be sure to read the entry form carefully, as there is a lot of information requested. Print your information clearly and legibly, as this will greatly aid the Show Secretary. Your entry form must be signed by the Rider, Owner, Trainer and possibly the Coach as well. These signatures CAN NOT be copies – they must be original signatures. It is possible that the rider, owner and trainer are all the same person, in which case you would duplicate the membership numbers accordingly in their respective columns on the entry form, and you must sign all locations on the reverse of the entry form (you can not say “same”). Also be sure to include the copies of your membership cards (USDF and USEF) for rider, owner, trainer, coach and horse, include a copy of a 2017/2018 Negative Coggins, a copy of a Rabies Certificate valid within one year of the date of the competition and signed by a veterinarian and a copy of your proof of vaccinations for Rhino/Flu dated within six months of the competition date. Last but not least – the CHECK. Be careful to add all your fees correctly and following the instructions in the Prize List for additional fees. Make out the Check as described in the prize list. Some entries require multiple checks – for example – a separate check for a stall deposit, or separate check for some other event or activity –so read the instructions in your prize list very carefully. There may be some shows that are 2 one day shows, where you will need to send in 2 entry forms. All the fees on the entry form applies to each show (for example: non-membership fees, federation fee, affidavit fee, etc.). If you are not sure about what to include or not to include, you can also call the Show Secretary. 3. Place your entry information into an envelope and mail it to the Show Secretary that is listed in the prize list. You must have your materials post marked on or after the opening date and on or before the closing date. As stated earlier, just because your entry arrives before the closing date does not guarantee you a spot at the show as they are filled on a first come first served basis. As an added measure, call your show secretary about 1 week after you’ve mailed the entry package and ensure that all information was received and there are no errors. You have up until the closing date to correct errors if you have made them (another reason to get your entry in early!). There may be penalties associated with incomplete or inaccurate entry packages, so follow all instructions carefully. Good luck to you all and HAPPY SHOWING!!! Please note: This article was intended to provide general guidelines to competitors entering Recognized Competitions in 2018. It is not meant to replace or substitute for any official rules of any of the governing organizations for a Recognized Competition, nor is it intended to be 100% comprehensive list of all rules and changes for 2018. We strongly encourage you to educate yourself with the governing organizations for additional information and details about this process. WNYDA accepts no liability for any information contained in this document.